Following up on my previous Laughlin River Run post. You may recall that forty-two members of the Hells Angels Motorcycle Club (HAMC) were indicted on federal racketeering and firearms charges from the confrontation between Hells Angels and Mongols members at Harrah’s Casino in Laughlin, NV, on April 27, 2002. The gun battle left three people dead and a total of nine guns and sixty-five knives were recovered at the scene. After six years Frederick Donahue of Rodeo, Ca. who vanished after indictments were handed down turned himself in and appeared last Friday in a Las Vegas court. His trial is scheduled for Sept. 8th. Donahue was not released from custody as the judge felt he was a potential danger to the community and a flight risk. Jorrg Maykopf of Germany remains the only fugitive. UPDATED: November 21, 2008 – Frederick Donahue pleaded guilty to violent crime in aid of racketeering and is expected to be sentenced to no more than 5 years in prison. 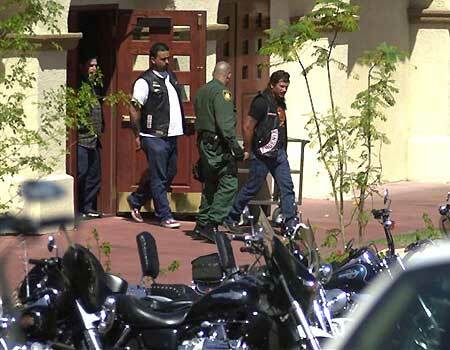 UPDATED: March 10, 2009 — Las Vegas Review Journal reports the last of the Hells Angels who faced federal charges in the 2002 Laughlin River Run casino shootout was sentenced. Frederick Donahue (34) was a fugitive for five years before surrendering in Las Vegas in July 2008. He is the seventh Hells Angels member sentenced in the fatal Harrah’s casino shootout during the motorcycle rally and will serve 30 months in federal prison. Photo courtesy of Mylife of Crime blog.